Arrive in to the French capital where you are met and transferred to your elegant boutique hotel. This evening meet your Resident Tour Director for dinner atop Montparnasse Tower where the city views are breathtaking. Set out with your group for a tour of the ‘City of Lights’, including stops at the iconic Eiffel Tower and Ile de la Cité, the historic and spiritual heart of Paris where you explore the stunning Notre-Dame Cathedral, a Gothic masterpiece that has become one of the most recognisable places of worship in the world. After lunch, aprons on for a hands-on baking class at a traditional boulangerie. After a morning at leisure in Paris, travel to Beaune, capital of Burgundy’s wine region. Visit the Hôtel-Dieu, a 15th century hospital now museum, before settling into your boutique accommodation. Day 4: Beaune - Lyon. Travel to a traditional, family-run mustard mill for a private small group tour and learn how to make this tasty condiment. Join a local sommelier in his home for a tutored tasting of memorable vintage wines, followed by lunch. Next, travel to Lyon for priority embarkation aboard ‘Amadeus Provence.’ Take time to settle into your premium cabin or suite with an open-air French or walk-out balcony. Then, gather this evening for a welcome cocktail and dinner. Arrive this morning in Mâcon. Travel privately by small group to Cluny to tour the abbey. After lunch, continue to Chardonnay on a Connections-only excursion. Sample its namesake grape for yourself at a private wine tasting. Dock in picturesque Chalon-sur-Saône. Your Resident Tour Director gives you an orientation of the town before you set off on your own to explore this delightful riverside town with its graceful cathedral. After lunch on board, visit medieval Brancion, continuing to the 17th century Château de Cormatin. See its turrets; gilded rooms; and ornate, English-style gardens. Half in ruins, it remains under the same private ownership today. Arrive in Lyon to tour its old quarter, walking the charming, centuries-old streets of this UNESCO World Heritage Site by small group, with insight from your Resident Tour Director and local guide. See the traboules (hidden passageways) of Croix-Rousse Hill. Proceed to the Gallo-Roman amphitheatre and visit the famous Les Halles de Paul Bocuse markets. Later, cruise the Rhône River and enjoy a private pre-dinner cocktail party in the ship’s Amadeus Club, hosted by your Resident Tour Director. End the evening at an exclusive Chef ’s Highlights dinner with fellow Connections guests. 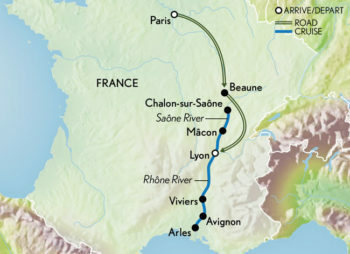 Join your group on a full-day excursion, starting at the Pont du Gard, a towering Roman aqueduct. Enjoy a Connections-exclusive lunch in its shadow before taking a fascinating tour of Avignon. Its centre, surrounded by medieval stone ramparts, features the prominent Palais des Papes and the remains of Saint-Bénezet bridge (Pont d’Avignon). After visiting the Palais des Papes, explore the city at your own pace, with time at leisure. This evening, step ashore to experience the flavours of the South of France during a Connections-only dinner at a specially chosen restaurant. Day 9: Sénanque – Arles. Begin your exclusive, day-long Connections excursion at the Cistercian Abbey of Sénanque, famous for its fields of lavender. In Saint Paul-de-Mausole, see the asylum where Vincent van Gogh was voluntarily interned for a year, taking note of the gardens that inspired some of his famous paintings. Then, stop at Mas de la Pyramide — a family-run Provençal farm — for a lunch brimming with freshly-plucked, home-grown produce. Talk with your hosts as you gain an inside perspective on rural life. Complete the day in Arles, a city settled since 800 BC. Discover its massive Roman amphitheatre, beautiful basilica and the Place du Forum, where Van Gogh painted his Café Terrace at Night. You have the chance to stand in the exact spot where the master artist set up his easel. Arrive this morning in Viviers, a small walled city steeped in history and nestled on the Rhône River. Travel by Connections vehicle to meet locals and learn about — and play — a traditional game of pétanque. Tonight, gather a final time with fellow guests and join the captain for a celebratory gala dinner. After breakfast, transfer to the Lyon airport, where you board your departure flight.